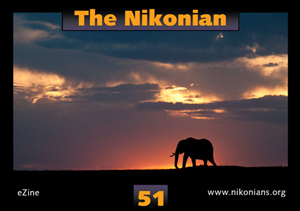 The latest edition of our eZine, THE NIKONIAN, #51, is now available for free download (4 MB PDF file). This issue highlights our recent 11th Annual Nikonians Photo Adventure Trip (ANPAT) in Utah and the winners of our Best of Nikonians - 2011 Images Photo Contest. Once again we approach that time of year when the urge to give is the strongest. All of us at the Nikonians Photoproshop wish you — your family and friends a Happy Holiday Season! 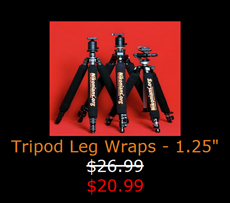 Lightsphere II flash diffusers, leg wraps, camera holsters and tripod bags, assorted camera plates and more are now featured. Offers are valid until stocks last. You will enjoy the addition of white cross-out lines on our prices during this special, indicating your savings potential. Make sure you scroll through the three pages of specials (nearly 50 at last count). SPECIAL NOTE for our Nikonians members using the Photoproshop in Europe. Most of the items mentioned in this News Blog are also available "across the pond." Simply click on the Nikonians Photoproshop map for your chosen region. For fast reference we have also prepared a Gift Giving Ideas page with items ranging in price from less than $20.00 USD to $100.00. These are the items guaranteed to put a smile on the face of a fellow Nikon enthusiast or Nikonians member. They include the popular hot-shoe mount bubble levels (in both two and three axis models), our top selling Nikonians Pro Strap for your camera and the tiny digital single-lens-reflex camera in the shape of a Nikon which is actually an 8GB USB flash drive in disguise. These flash drives were great stocking stuffers last year. Check the top of the page and have a look at our brand new Nikonians 2012 Calendar! If you want to leave the purchasing decision up to your gift receipient, we have you covered. Check out our gift vouchers in increments of $25, $50 and $100 USD. Want to go large with that order? We're getting enthusiastic response to some of our specialized items such as the Solmeta Geotagger N3 GPS Receiver. This is a 3-axis smart camera GPS unit, with very quick and highly accurate GPS lock. 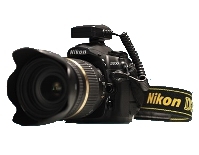 It is compatible with Nikon D3, Nikon D3X, Nikon D3S, Nikon D700, Nikon D300, Nikon D300s, Nikon D200, Nikon D90, Nikon D2X, Nikon D2Xs, Nikon D2Hs, plus Nikon D3100, Nikon D5000, Nikon D5100 and Nikon D7000. Another popular item is our line of MAGICA products. Nikonians co-founder J. Ramón Palacios spent many years researching the ideal tripod and he used the expertise of fellow members of the community to narrow that search down to MAGICA. You can read his story on the search and results and judge for yourself. The collaboration between Markins and Nikonians on advanced camera support since 2004 has led to many innovations in the industry and now Markins brings us a new product, reducing the final weight of a MAGICA for added convenience in the field, improving the ability to pack it inside luggage for airplane travel by reducing its top diameter, while maintaining its vibration absorption quality. 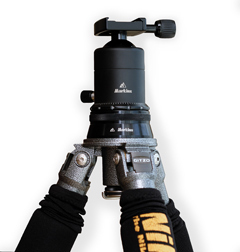 The Markins TH-200 and TH-300 Hubs replace the platform hub reducing weight and top diameter of Series 2 and Series 3 carbon fiber tripods respectively, whether a Mountaineer or a Systematic model, providing a slim profile while keeping the sturdiness and vibration dampening of the previous TB base plate based MAGICA. We now have an expanded catalog of LensCoat protection for your lenses and DSLR bodies. 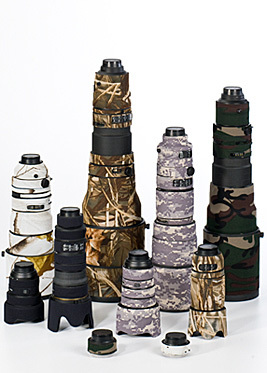 These lens covers camouflage your 14mm to 800mm lens in a variety of patterns. They are manufactured from 100% closed-cell neoprene and offer protection from bumps, jars and nicks. They also provide a thermal barrier, protecting your hands from cold lenses in lower temperatures. They are easy to install and remove, sliding on like a sleeve and leaving no residue on the lens. LensCoat™ lens covers are waterproof, providing protection in harsh conditions. 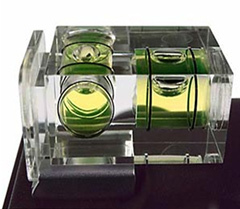 Other features include clear, flexible UV plastic windows over the AF/VR controls and the distance-scale window. The cover has custom holes revealing your alignment for lens changes to be made without removing the cover. 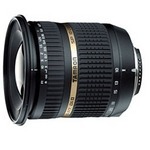 They are available for a wide variety of lenses and for teleconverters. Your purchases help sustain the growth of the Nikonians community. We thank you for your support! Once again we approach that time of year when the urge to give is the strongest. 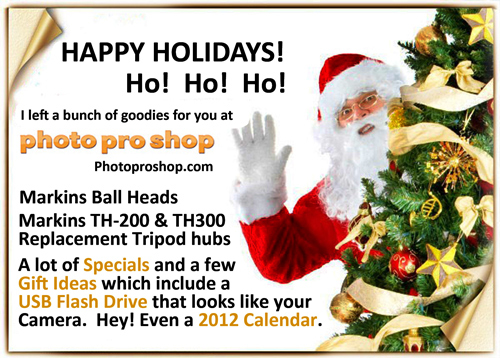 All of us at the Nikonians Photoproshop wish you -- your family and friends a Happy Holiday Season! SPECIAL NOTE for our Nikonians members using the Photoproshop in Europe. Most of the items mentioned in this newsletter are also available "across the pond." Simply click on the Nikonians Photoproshop map for your chosen region. Just in time for the holidays, our corporate sponsor Berger Brothers is offering exclusive pre-orders on the flagship replacement Nikon SB-910 Speedlight. 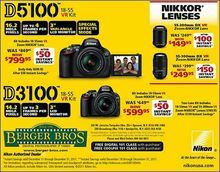 All Nikonians members can take advantage of this special offer, so why wait? Join now and get exclusive access to this deal and other great advantages! "The Nikonian" eZine app for the iPad has been updated to Version 1.1. You'll get access to our exclusive newsletters, packed full of equipment reviews, great photos from our ANPAT trip, updates of our Academy classes, and of course, exclusive Nikonians offers! Grab the app now! Join Nikonians on Google Plus! Nikonians has opened a new page on Google Plus. Join the thousands of photography enthusiasts in our community and get in on the latest news, conversations and offers!